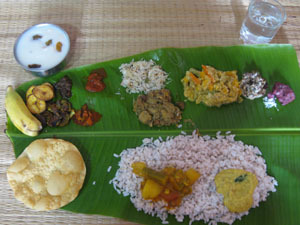 We Keralites make different kinds of chammanthi using different veggies, dry fish, prawns etc. I could never imagine a chammanthi with chena(yam), brinjal etc but recently I saw their recipes in one of Mrs. KM Mathew’s cookbooks. Interesting, right?? I will share their recipes sometime soon. Btw I have never heard or tasted a chicken/meat chutney but I am pretty sure that someone might have the recipe. Please do share if you have it. Today we have the recipe for the mouth-watering unnakka chemmeen chammanthi which tastes great with kanji / plain rice. You can find dried prawns in any Asian store. Give this a try sometime. You will love it!! 1. Remove head and tail of the dried prawns. Wash properly and pat dry. There is no need to wash them if they are already cleaned. Roast the dried prawns and dry red chillies together in a pan until the prawns turn light brown and the dry red chillies turn slightly crispy. It would not take more than 5 – 10 minutes. Keep aside to cool. 2. Add the roasted dried prawns, dried red chillies, grated coconut, ginger, pearl onions, tamarind, curry leaves and salt in a blender. Grind well without adding any water. Scrape the sides of the jar in between. Adjust the salt and tamarind to suit your taste. Shape the ground mixture to a ball. Enjoy this chammanthi with plain rice/ rice porridge. My alltime fav chammanthi.Love that pathram. I love this. we are planning a trip to Kerala and looking forward to all the dishes that I have drooled at you blogger’s spaces. this one is a must try. let me find the dry prawns…looks delicious. My all time favorite..looks so yummy and perfect. njan ethu kazhicha kalm thanne marannu tto…Super chammanthi…. Unakka chemmen chammanthi delicious. Adipoli. nalla choodu kanjiyum, chemmeen chammanthiyum…athinte oru manamum tasteum, aahaaaa….enikkipppo kothy varunnundu. Dear I loved the presentation…and I bet it must very tasty too…. Quite a new recipe for me …… luv the presentation. enikku vayya…ithu mathram mathi enikku oru plate chorunnan…kidilan..
this makes me homesick…my mother makes the same chammanthi, without adding ginger. Let me also give it a try.